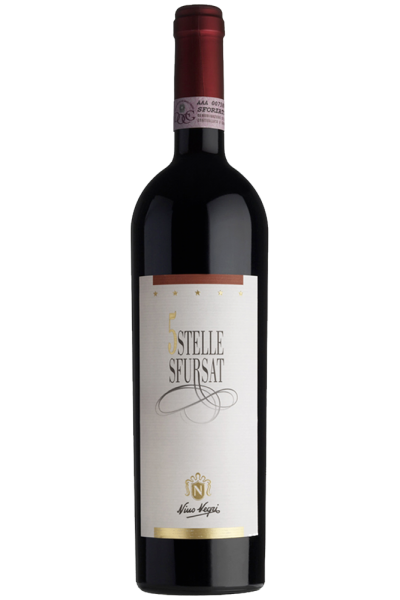 Unique in its kind, the Sfursat 5 Stelle is the spearhead of Nino Negri's wine production. Celebrated red wine with great structure and elegance, owes its name to the practice of forcing, that is to let the best bunches wither on the plant for a few months after the harvest, so as to prolong its maturation. Once harvested, the grapes will be put in special trays to further dry, so as to evaporate the water present in the grapes preserving the sugar content and making sure that the aromatic components present in the grapes can express themselves at their best; a kind of raisin wine, but red and dry, with an important structure, unique character and rare complexity. Bright garnet color with a wide olfactory range that releases ripe cherries and chocolate, tobacco, liquorice, cedar wood and leather. Full and enveloping the taste, characterized by evolved tannins, great freshness and long persistence from the fruity and balsamic references. With braised and roasted game, seasoned aged cheeses, or alone, in an armchair, in front of the fireplace.